Eight Ocean Grove Surf Life Saving Club members travelled to New South Wales for the 2019 Interstates. Marcus Bird, Tia McNaughton and Piper McNaughton competed for the youth team while Campbell Bohan, Jesse Coulson, Lexi McNaughton and Kimmy Gilling battled it out for the senior Victorian team. 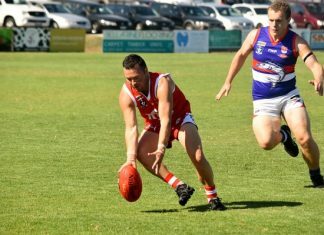 The Vic senior team was hoping for a third-placed finish, but ended up in fourth spot by a solitary point. Coach Sonia Kinsey said the Ocean Grovers acquitted themselves well. “The locals did really well – they are very young and inexperienced and have done themselves proud after coming fifth last year,” she said. “They’ve come so far in 12 months. It’s very hard not getting the racing practice that NSW and Queensland get every weekend and I’m very proud of all the local crew.